Diabetes is rapidly becoming one of the biggest dangers to teenagers and even young children in China due to a serious lack of nutritional education, warn health experts. It was confirmed last week that the country has the highest population of diabetics in the world, with more than 92 million sufferers. According to figures from the Chinese Medical Doctors' Association, children make up about 5 percent of that figure. The number of juveniles with the potentially fatal condition is rising by 10 percent every year, a report by the association said. But it is not just the impact on a child's health doctors are concerned about. Discrimination toward diabetes can also seriously affect a sufferer's chances of finding a job or even getting accepted into college. "Although the proportion of juvenile diabetics still accounts for a low percentage of all diabetics, their numbers have increased very fast in recent years," said Ji Linong, director of endocrinology at the People's Hospital of Peking University. "This is a situation that calls for urgent attention from society." 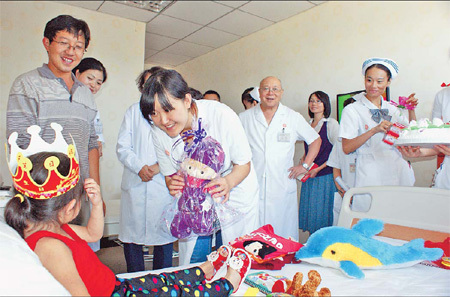 One of the youngest patients ever to be diagnosed with the condition is a 3-year-old girl admitted to Shaoxing People's Hospital in Zhejiang province in January. Staff said they have treated a dozen or so child diabetics under 10 years old in recent years. The girl's grandmother, who is in her late 50s and did not want to be named, took the youngster to get help after noticing she was losing a lot of weight. "She loves fizzy drinks and she always seemed anxious to eat," she said. "But the more she ate, the thinner she got." Tests showed the patient's blood-sugar level was more than 11 millimoles per liter (the standard unit of measurement), far higher than the normal 3.9 to 6.1 mmol/L. "Diabetes is no longer just a problem among the elderly - the number of young sufferers is becoming very serious," said Zhu Qiqian, director of Shaoxing Diabetes Prevention Center. "The (3-year-old) patient is probably looking at a lifetime of treatment." With child obesity on the rise in China, Zhu warned that parents must be vigilant to spot the symptoms, such as excessive thirst, weight loss, fatigue, frequent urination and blurred vision. Diabetes causes excessive levels of sugar in the blood, either because the body does not produce insulin or because certain cells do not respond properly to the insulin produced, it kills about three million people worldwide each year. Among the various strains of the condition are Type I and Type II, and for years most child diabetics across the globe had Type 1, which is usually kept under control with regular insulin injections. However, over the past decade, experts say many nations have seen an explosion in children with Type II, which carries with it an increased risk of heart attacks, amputation, kidney failure and strokes. 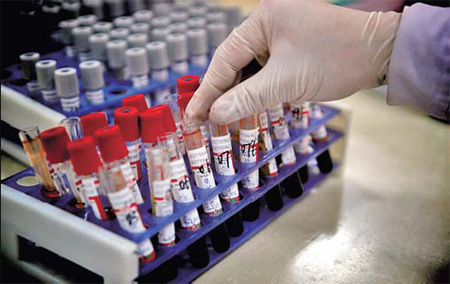 In China, the number of Type II cases has steadily risen from 10 percent of all reported cases to more than 50 percent in recent years, said Ge Huanqi, president of Beijing Ruijing Diabetes Hospital. "The increase is linked to our improved living standards, which has led to unhealthy diets and inactive lifestyles," he said. "Children today spend long periods playing video games or sitting at a desk studying in class or at home. Very few get enough exercise. Meanwhile, they are eating too much high-calorie and fatty foods, which explains why we are seeing more obese children on campus." A study by Qingdao Endocrinology Diabetes Hospital last year that included 10,000 school students aged 8 to 18 found bad dietary habits were the No 1 cause of diabetes. China's national curriculum does not require schools to offer classes in food or nutritional education. Zhang Ran, a schoolboy from Changchun, capital of Jilin province, is only 13 years old and 1.1 meters tall but already weighs more than 60 kg (about 133 pounds). "Before he arrived for treatment, his parents said Zhang used to drink a 2.5-liter bottle of cola every day and rarely drank any water," said Ge. Although the boy ate three large meals a day, he often complained of being hungry and snacked constantly, Ge explained. "At first his parents thought his massive appetite was a good sign but became concerned about his health when his weight ballooned." Obesity raises the levels of sugar, fat and pressure in the blood, and when Zhang was finally referred to Beijing Ruijing Diabetes Hospital in 2008, tests showed his blood-sugar level was 8.5 mmol/L. He was diagnosed with Type II diabetes. After receiving treatment, which included a strict diet and plenty of exercise, the patient's condition was brought under control. He has since lost weight and returned to his studies, said Ge. "We learned a very important lesson," said the boy's father Zhang Shuang. "Before, we simply thought that if we gave him everything he wanted we were showing our love. Now we realize we were totally wrong." With China's one-child policy, parents often dote on their children and cater to their every whim, said Ge. "They need to ask themselves, Is this good for my child's health?" In Beijing alone, almost 20 percent of primary and middle school pupils are overweight, according to a recent report by the municipal government. Figures from its health bureau also show the rate of pre-diabetes (those with early symptoms) among 10 to 18 year olds in the capital has hit a high of more than 3 percent. The trend is slowly becoming more common across the country, which Ge believes shows "most Chinese still do not have a concept of how to eat healthily and get the right nutrition". "We still have a long way to go in promoting and educating people about healthy eating," he said. Ge also called on the government to enhance its inspections of food products - especially those targeted at children - to better control the use of additives. "As there are more child diabetics, more hospitals should also establish special departments to carry out systemic checks and try to diagnose as many cases as early as possible," he added. Aside from the obvious dangers, diabetes can also slow a child's physical and mental development. The condition can cause teenagers to suffer sexual dysfunctions and make girls more vulnerable to urinary tract infections, say doctors. However, these can be kept under control with a healthy diet and exercise. "Parents simply need to make sure their child gets three meals a day that include vegetables, beans and coarse cereals," said Yu Shuangyu, director of health for Qingdao Children's Hospital in Shandong province. "They should prevent their child from excessive eating or drinking, avoid giving them greasy or fried foods, and carefully ration the sugary snacks they eat. "Children should also be encouraged to do exercise and take part in outdoor activities, so they can use the energy they consume," said the medic. Just as important, however, is for parents to cushion the psychological blow that can come from being diagnosed with diabetes, according to Chen Weiya, a member of the Chinese Diabetes Society. "Ensuring their mental health is essential," he said. "It's important not to leave any psychological scars." Diabetics often experience loneliness and depression at school, and may feel inferior to other students, he said, which means teachers have a massive part to play in rebuilding their confidence. 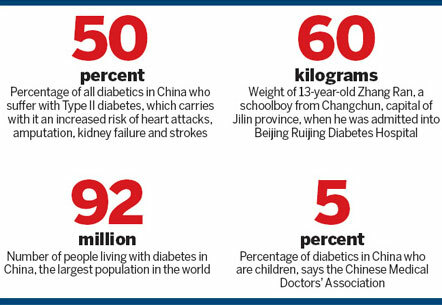 And although health officials acknowledge that public awareness about the condition is low in China, the stigma attached to diabetes means adolescent sufferers also face a tough future. Discrimination against diabetics remains a huge problem, according to the members of the Beijing Diabetes Prevention Association, which was founded in 1996. Students with diabetes still find it difficult to go on to further education after high school because college admission officials reject them as they fear the pressures of study may put them at risk of going into a coma or even dying. All applicants are required to declare any illnesses they have on a medical history form. However, as doctors do not check applicants' blood-sugar levels during the college entrance physical examinations, many diabetics hide their condition. "Once at university, they take their medicine and injections in secret," said Zhang Zhenlong, a member of the association's secretariat. Many young diabetics are also afraid to fall in love, get married or have children because "they fear being hurt or rejected, or fear the condition may be passed to their loved ones", he added. Many companies also discriminate against diabetics when hiring - so even with a graduate degree, finding a good job can be difficult. "We're in contact with more than 10,000 diabetics every year, among whom about 1,000 are young people. The majority of them complain about the bias they face," said Zhang Zhenlong. "Diabetes blights the lives of sufferers, many of whom must receive lifelong treatment," he said. "Diabetes is not infectious, and society needs to be more tolerant and show understanding towards this group." Working with 42 hospitals across the capital, the Beijing Diabetes Prevention Association carries out various events focusing on diabetes education and awareness every year. Activities include handing out free booklets, and inviting experts to give speeches at hospitals and in communities. "I hope more people can join us and learn more about diabetes, which will benefit not only the participants but their entire families," said Zhang Zhenlong. He added that the association is now working on a book that uses pictures and cartoons to introduce information about preventing diabetes, treatment, diet and exercise.